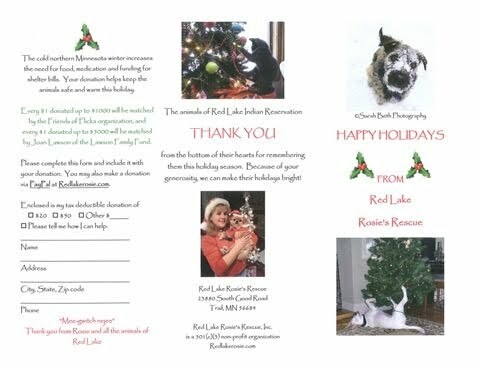 Friends of Flicka is a long-time supporter of Red Lake Rosie's Rescue located on the Red Lake Indian reservation in northern Minnesota. This amazing rescue is the full-time volunteer mission of Karen Good, a Native woman and elder for her tribe. Karen and Red Lake Rosie's Rescue were first to receive the Kodiak Award in 2008 from Friends of Flicka. It is awarded to a volunteer or organization whose efforts on behalf of abused or abandoned animals are so extraordinary that special recognition is deserved. As we wrote then, "Good's work is hampered by the poverty, remoteness of location and extremes of climate at Red Lake. She has rescued hundreds of dogs and cats including some that have been left for dead." The Animals at Red Lake Rosie's Rescue from JanetRoper on Vimeo. Most recently we donated matching funds for a fundraising effort in the month of December. Over $20,000 was raised to buy supplies and pay medical bills for the animals for the remainder of the winter. Now Friends of Flicka is happy to join in congratulating Karen Good as a 2011 Eleven Who Care honoree. "The Eleven Who Care program was created 27 years ago to recognize the outstanding volunteers that serve our community. Each year hundreds of volunteers are nominated for the award and the Eleven Who Care Board of Governors select the eleven to be honored. The honorees represent the variety of opportunities available in our community. They truly exemplify the belief that one person can make a difference."